A new business in Mississippi is not out of reach. So have you been wondering: just how do I start a business in Mississippi? And more importantly, can I do so no matter what the economic conditions are? Can I start a new business in Mississippi during a recession? Mississippi is in Business Insider‘s middle set of ten states to start a new business in, according to a 2016 article. And this is for the whole country. The business tax climate is fair, although better than Ohio’s. The state does, though, have the lowest cost of living in the entire nation. Mississippi also has a higher percentage of available employees than most states. But potential employees’ education levels are low. Mississippi also has the country’s lowest per capita GDP at $31,894. In 2018, Forbes placed Mississippi at number 44. Also in 2018, Fit Small Business clocked in Mississippi at number 38. So, why the discrepancy? Keep in mind, these three sites all have differing methodologies. Fit Small Business praises Mississippi for the lowest cost of living in the nation. But apart from a middle of the road tax level, everything else is below par. In particular, the costs of starting a business, quality of life, and labor market are in the bottom ten. Labor market is a measure of the desirability of an area, along with the number of people with bachelor’s degrees. Without the #1 listing for quality of life, Fit Small Business would have likely placed Mississippi in the 40s. Forbes says Mississippi has middle of the road business costs and regulatory environment. But everything else is in the lowest ten states. This includes #49 for labor supply, and dead last for growth prospects. Only you can decide if starting a business in Mississippi is going to be worth it. The biggest industries in Mississippi include agriculture and manufacturing. Smart business owners can find new opportunities and take advantage of the bigger industries in the state. They can do so by offering goods or services such as trucking for any industry. More ideas are chemical support for agriculture and shipping. Here is exactly how to start a new business in Mississippi. According to the Mississippi Secretary of State’s website, registering business trade names is optional. However, corporate names must be unique. A business owner must choose a name not in use by another corporation. Before they file to incorporate a small business, thoroughly search online and other records. Search an online database of corporations registered in Mississippi at the Mississippi Secretary of State website. It is not necessary to reserve a name before filing Articles of Incorporation. But if a business owner wants to reserve a particular name before they file, they can submit a name reservation application online. Do so at Reserve a Mississippi Corporation Name on the Mississippi Secretary of State website. The fee to reserve a name is $25.00. For a corporation, the next step is to choose a registered agent. A registered agent will act as an agent for service of process. They will also be responsible for receiving all legal and tax documents on behalf of the corporation. The business owner can indicate an adult Mississippi resident or a corporation as the registered agent. However, a corporation cannot act as its own registered agent. Check the state webpage for a list of professional licenses to look into. Check with your local municipality, city or county office or website. See if there may be any local licensing or permit requirements. For example, in Biloxi you will need to go to the Forms/Permits page on the city of Biloxi website. General information is with the Mississippi Secretary of State. If you wish to dig any deeper, you must create an online account. Check out the Mississippi Department of Revenue or use their online system, TAP. Alliance offers Mississippi virtual business office space in Jackson only. Go to Opus for Biloxi, Brandon, or Meridian. Business owners looking for Mississippi virtual office space in Gulfport, Hattiesburg, Oxford, or Tupelo, or elsewhere in the state, can ask local business owners. They might also want to try computer user groups for leads in this area. Other options may be to look for virtual business office space in nearby states. These are Alabama, Arkansas, Louisiana, and Tennessee. Prices will undoubtedly vary from state to state. Business credit is credit in a company’s name. It doesn’t connect to an owner’s individual credit, not even if the owner is a sole proprietor and the solitary employee of the small business. As such, an entrepreneur’s business and consumer credit scores can be very different. Given that small business credit is distinct from personal, it helps to secure an entrepreneur’s personal assets, in the event of court action or business insolvency. Also, with two distinct credit scores, a small business owner can get two different cards from the same vendor. This effectively doubles buying power. Another benefit is that even new ventures can do this. Heading to a bank for a business loan can be a formula for disappointment. But building business credit, when done properly, is a plan for success. Consumer credit scores depend on payments but also additional elements like credit use percentages. But for company credit, the scores really only hinge on if a business pays its invoices promptly. Learn more here and get started toward building business credit attached to your company’s EIN and not your SSN. Growing company credit is a process, and it does not happen without effort. A company must proactively work to develop company credit. Nevertheless, it can be done readily and quickly, and it is much speedier than building individual credit scores. Merchants are a big component of this process. Doing the steps out of sequence will result in repetitive denials. 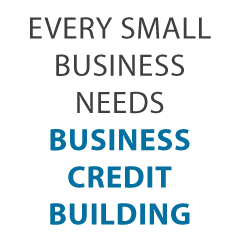 Nobody can start at the top with small business credit. For instance, you can’t start with retail or cash credit from your bank. If you do, you’ll get a rejection 100% of the time. A business must be fundable to credit issuers and merchants. For that reason, a business will need a professional-looking web site and e-mail address. And it needs to have site hosting from a vendor such as GoDaddy. In addition, company telephone and fax numbers need to have a listing on 411.com. Additionally, the business phone number should be toll-free (800 exchange or the equivalent). A small business will also need a bank account dedicated strictly to it, and it needs to have every one of the licenses necessary for operating. Visit the Internal Revenue Service web site and acquire an EIN for the company. They’re totally free. Pick a business entity like corporation, LLC, etc. A company can start off as a sole proprietor. But they will more than likely wish to change to a sort of corporation or an LLC. This is in order to minimize risk. And it will optimize tax benefits. A business entity will matter when it concerns tax obligations and liability in case of a lawsuit. A sole proprietorship means the business owner is it when it comes to liability and tax obligations. No one else is responsible. If you do not, then your personal name is the same as the small business name. Consequently, you can end up being personally accountable for all company financial obligations. In addition, per the IRS, with this structure there is a 1 in 7 chance of an IRS audit. There is a 1 in 50 chance for corporations! Prevent confusion and significantly lower the odds of an Internal Revenue Service audit simultaneously. Begin at the D&B web site and get a free D-U-N-S number. A D-U-N-S number is how D&B gets a business into their system, to generate a PAYDEX score. If there is no D-U-N-S number, then there is no record and no PAYDEX score. Once in D&B’s system, search Equifax and Experian’s sites for the company. You can do this at www.creditsuite.com/reports. If there is a record with them, check it for accuracy and completeness. If there are no records with them, go to the next step in the process. By doing so, Experian and Equifax will have activity to report on. First, you should build trade lines that report. This is also referred to as the vendor credit tier. Then you’ll have an established credit profile, and you’ll get a business credit score. And with an established business credit profile and score you can start to get credit in the retail and cash credit tiers. These types of accounts have the tendency to be for the things bought all the time, like marketing materials, shipping boxes, outdoor work wear, ink and toner, and office furniture. But first off, what is trade credit? These trade lines are credit issuers who will give you starter credit when you have none now. Terms are oftentimes Net 30, versus revolving. So, if you get an approval for $1,000 in vendor credit and use all of it, you will need to pay that money back in a set term, such as within 30 days on a Net 30 account. Net 30 accounts need to be paid in full within 30 days. 60 accounts have to be paid completely within 60 days. Compared to with revolving accounts, you have a set time when you must pay back what you borrowed or the credit you made use of. To kick off your business credit profile the proper way, you ought to get approval for vendor accounts that report to the business credit reporting agencies. As soon as that’s done, you can then make use of the credit. Not every vendor can help like true starter credit can. These are vendors that will grant an approval with very little effort. You also want them to be reporting to one or more of the big three CRAs: Dun & Bradstreet, Equifax, and Experian. You want 5 to 8 of these to move onto the next step, which is the retail credit tier. But you may need to apply more than one time to these vendors. So, this is to prove you are responsible and will pay in a timely manner. Once there are 5 to 8 or more vendor trade accounts reporting to at least one of the CRAs, then move onto the retail credit tier. These are companies such as Office Depot and Staples. Only use your Social Security Number and date of birth on these applications for verification purposes. For credit checks and guarantees, use the small business’s EIN on these credit applications. One example is Lowe’s. They report to D&B, Equifax and Business Experian. They want to see a D-U-N-S and a PAYDEX score of 78 or higher. Are there 8 to 10 accounts reporting? Then progress to the fleet credit tier. These are companies like BP and Conoco. Use this credit to purchase fuel, and to fix, and maintain vehicles. Only use your Social Security Number and date of birth on these applications for verification purposes. For credit checks and guarantees, make certain to apply using the business’s EIN. One such example is Shell. They report to D&B and Business Experian. They want to see a PAYDEX Score of 78 or higher and a 411 business phone listing. Shell might claim they want a specific amount of time in business or revenue. But if you already have sufficient vendor accounts, that won’t be necessary. And you can still get approval. Have you been sensibly managing the credit you’ve gotten up to this point? Then move to the cash credit tier. These are businesses like Visa and MasterCard. Only use your Social Security Number and date of birth on these applications for verification purposes. For credit checks and guarantees, use your EIN instead. One such example is the Fuelman MasterCard. They report to D&B and Equifax Business. They need to see a PAYDEX Score of 78 or better. And they also want you to have 10 trade lines reporting on your D&B report. Plus, they want you to have an established business. These are companies like Walmart and Dell, and also Home Depot, BP, and Racetrac. These are normally MasterCard credit cards. If you have 14 trade accounts reporting, then these are feasible. Know what is happening with your credit. Make sure it is being reported and attend to any inaccuracies as soon as possible. Get in the practice of taking a look at credit reports and digging into the particulars, and not just the scores. Update the relevant information if there are inaccuracies or the data is incomplete. So, what’s all this monitoring for? It’s to challenge any errors in your records. Errors in your credit report(s) can be taken care of. But the CRAs generally want you to dispute in a particular way. Disputing credit report mistakes typically means you send a paper letter with copies of any proofs of payment with it. These are documents like receipts and cancelled checks. Never mail the original copies. Always send copies and retain the original copies. Fixing credit report errors also means you precisely detail any charges you contest. Make your dispute letter as understandable as possible. Be specific about the concerns with your report. Use certified mail so that you will have proof that you mailed in your dispute. Always use credit smartly! Don’t borrow more than what you can pay back. Keep track of balances and deadlines for repayments. Paying promptly and in full will do more to boost business credit scores than nearly anything else. Establishing small business credit pays. Great business credit scores help a small business get loans. Your lending institution knows the small business can pay its debts. They understand the business is bona fide. The business’s EIN attaches to high scores and lenders won’t feel the need to demand a personal guarantee. Business credit is an asset which can help your small business for years to come. Learn more here and get started toward opening a new business in Mississippi. Want to start a new business someplace else in America? Then check out our handy guide to starting a business in any state in the country.